The tour will be 15 days in length ( 22nd July to August 5th, 2020 - Dates to be confirmed shortly) and includes various sight seeing locations in Germany and Switzerland. 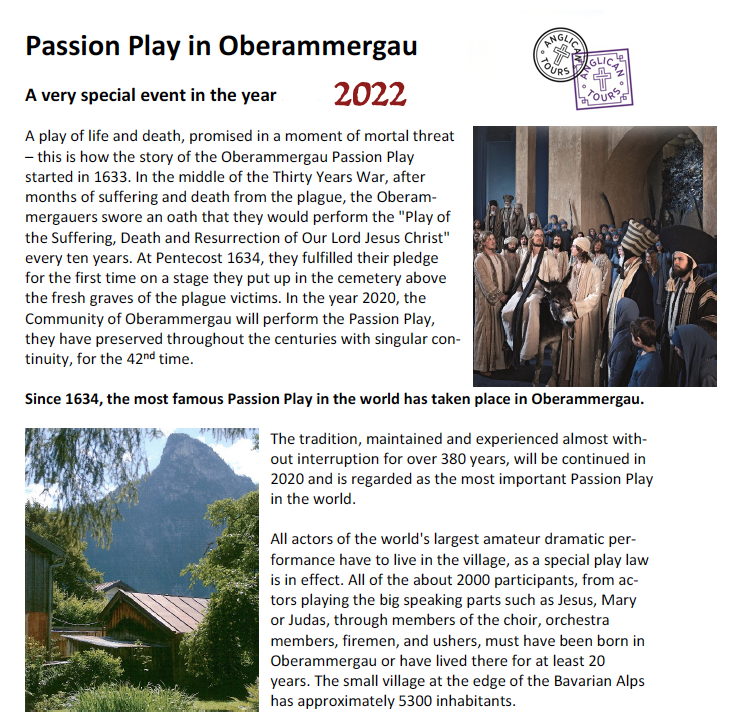 We are very excited about being able to negotiate excellent seating and accommodation in Oberammergau. Class B and 4 Star accommodation. As with all our tours, the approximate prices ($8,875 Twin accommodation) will include airfares (Ex Perth, Sydney, Melbourne and Adelaide), tipping, Breakfasts and Dinners (we buy our own lunch), entry fees as per itinerary, quality 4 star accommodation etc. We can't confirm airfare costs until closer to the tour as airline schedules not available until early in 2020. Basically all you need in extra outlay will be your personal day to day expenses (drinks, eats etc) and visa costs. - No $$$ surprises. these are only published around 9 months prior to departure (hence the estimated cost above). We are hopeful that when negotiating airfares, we will be able to reduce the tour cost by a few hundred dollars. Should you wish to go on to other areas before or after the tour, we can arrange this for you. If you wish to include your name on a list saying you were "interested" in being placed on the waiting list, please click here and we will keep you informed. If you wish to join us definately, then a $1500 deposit is required at time of your enquiry which is non refundable. Click here for an overview outline of the areas we are planning to visit in GERMANY & SWITZERLAND. To return to our main tour site, click here.